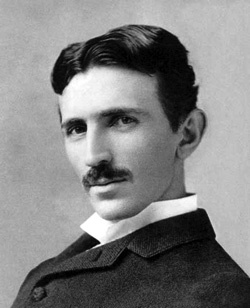 Nikola Tesla (1856-1943) was an electrical inventor, well known as a competitor of arch rival Tom Edison. Where Edison’s inventions include the light bulb, the microphone in the telephone and the phonograph, Tesla’s inventions include fluorescent lighting, the AC hydroelectric power system and wireless communication. Tesla is therefore mostly billed as an inventor. The fact is, Tesla was also a physicist who studied in college such courses as analytic geometry, experimental physics and higher mathematics.1 In his early 1890s lectures at Columbia University, the Chicago World’s Fair and at Royal Societies in Paris and London, building on the ideas of Isaac Newton and Lord Kelvin, Tesla demonstrated and discussed the structure of atoms as being similar to solar systems and wave-like and particle-like aspects to what later became known as the photon. Colleagues he lectured before and corresponded with included many Nobel Prize winners like Wilhelm Roentgen, J.J. Thompson, Lord Raleigh, Ernst Rutherford and Robert Millikan and other scientists such as Elmer Sperry, Sir William Crookes, Sir Oliver Lodge, Lord Kelvin, Heinreich Hertz and Hermann von Helmholtz. As far as I know, no standard text on the history of physics mentions Tesla even though these ideas would lead to Nobel Prizes when they were further developed by Rutherford and Bohr (with their solar-system description of the atom with electrons orbiting the nucleus) and Einstein’s discovery of the photoelectric effect, which was equivalent to Tesla’s wave and particle-like description of light. However, another idea which Tesla discussed was abandoned by modern physicists, and that was the concept of the all pervasive ether. This led to a number of key differences between Tesla’s view of the world as compared to that of Albert Einstein (1879-1955). Tesla disagreed with the findings of Einstein’s Theory of Relativity in a number of ways. As far back as the turn of the century, Tesla thought that he had intercepted cosmic rays emanating from the sun that attained velocities “vastly exceeding that of light.” In the last decade of his life he also claimed that these cosmic rays could be harnessed to generate electrical power. Tesla also saw radioactivity as evidence of the material body absorbing energy as much as it was giving it up. On a separate front, the inventor stated that the impulses transmitted from his turn of the century Wardenclyffe wireless transmitting tower would also travel at velocities in excess of the speed of light. He likened the effect to the moon’s shadow spreading over the Earth. It is very difficult to explicate the first two speculations concerning tachyonic (faster than lightspeed) cosmic rays and radioactivity. However, with regard to the third claim, this suggestion that he transmitted energy at speeds in excess of the speed of light can be discussed from a variety of points of view. As the Earth has a diameter of roughly 25,000 miles, and light travels at about 186,000 miles/second, one can see that it would take light approximately 1/7th of a second to circle the Earth. But does the Earth itself exist in its own realm, that by the nature of its size transcends the speed of light? For example, does the north pole, interact/exist with the south pole instantaneously? If so, in a sense the theory of relativity is violated as nothing, accordingly, can “travel” faster than the speed of light, yet the Earth’s very electromagnetic unity belies that theory. Concrete proof that relativity can be violated can be found in George Gamow’s watershed book Thirty Years That Shook Physics. Gamow, one of the founding fathers of quantum physics, tells us that in the mid-1920’s, Goudsmit and Uhlenbeck discovered not only that electrons were orthorotating, but also that they were spinning at 1.37 times the speed of light. Gamow makes it clear that this discovery did not violate anything in quantum physics, what it violated was Einstein’s principle that nothing could travel faster than the speed of light. Paul Adrian Dirac studied the problem. Following in the footsteps of Herman Minkowski, who used an imaginary number i, (the square root of -1) to be equivalent to the time coordinate in space-time equations, Dirac assigned the same number i to electron spin. In this way he was able to combine relativity with quantum mechanics and won a Nobel Prize for the idea in the process (1966, pp. 120-121). That was the upside. The downside was that the finding that elementary particles spin faster than the speed of light as a matter of course went the way of the passenger pigeon. No physicist talks about this anymore. What this means is that the entire evolution of 20th and nascent 21st century physics is evolving ignoring this key Goudsmit and Uhlenbeck finding. The ramifications suggest that elementary particles, by their nature, interface dimensions. Because they are spinning faster than the speed of light, the idea is that they are drawing this energy from the ether, a pre-physical realm, and converting the energy into material form. On a body as large as the sun, it would be impossible to project a disturbance of this kind [e.g., radio broadcasts] to any considerable distance except along the surface. It might be inferred that I am alluding to the curvature of space supposed to exist according to the teachings of relativity, but nothing could be further from my mind. I hold that space cannot be curved, for the simple reason that it can have no properties. It might as well be said that God has properties. He has not, but only attributes and these are of our own making. Of properties we can only speak when dealing with matter filling the space. To say that in the presence of large bodies space becomes curved, is equivalent to stating that something can act upon nothing. I for one, refuse to subscribe to such a view.